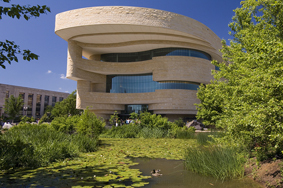 The National Museum of the American Indian houses one of the world’s largest and most diverse collections of its kind. The museum’s sweeping curvilinear architecture, its indigenous landscaping, and its exhibitions, all designed in collaboration with tribes and communities from across the hemisphere, combine to give visitors from around the world the sense and spirit of Native America. The museum is open 10 AM–5:30 PM; closed December 25. Exhibition spaces and the store begin closing at 5:15 PM. The Mitsitam Cafe is open daily 11 AM–3 PM; closed December 25. The Mitsitam Espresso Coffee Bar is open daily 10 AM–5 PM. The imagiNATIONS Activity Center is open Tuesday–Saturday, 10 AM–4 PM; Sunday, 11 AM–3 PM. The museum does not have parking. Parking is available by meter on the surrounding streets and in local paid parking garages. There are nine bus drop-off only spaces on Maryland Avenue accessible from 3rd Street. The museum is open 10 AM–5:30 PM daily; closed December 25. (Exhibition spaces and store begin closing at 5:15 PM).